My job is to look at data about living standards – and the policies that affect them. But determining whose standards of living are lowest requires calculations (and judgements) as to how we should compare, say, the income of a couple with three kids to the income of a single adult. And these kinds of calculations suggest a couple of questions this Valentine’s Day: can we put a price on the value of a couple moving in together, and what would happen if everyone in the UK paired off? What are the typical financial benefits of coupling? We don’t need to make up the figures from scratch. Governments already place a figure on the value of living together, to make it easier to compare families of different sizes to help judge which groups need the most help. Let’s say Alice, living alone, has a disposable income of £20,000. Her boyfriend, Bob, nets £20,000 too, but they live separately. Carol is single but also nets £20,000 – and of course, all three are judged to be equally well off. But what happens if Alice and Bob move in together? How can we then compare their combined standard of living to that of single Carol? We don’t just average their incomes (which would give £20,000) as we need to account for the lower cost of living that comes from sharing a bedroom, heating, and so on. But we also don’t say that their combined £40,000 makes them as well off as one person living on that same total – after all, they still have two mouths to feed. Instead, using the most commonly used scale, we take their combined £40,000 income and divide it by 1.5. This is a process called ‘equivalisation’, and can also account for the number of children. That adjustment gives them an equivalised income of £26,700 for comparisons like these. Which is to say that their standard of living has jumped up considerably just by them moving in together (ignoring any other pros or cons!). Whereas before Alice and Bob had the same circumstances as single Carol on £20,000, now Carol would need to have an income of £26,700 to match the couple’s living standards. This leap from £20,000 to £26,700 is a 33 per cent jump, but this is disposable (after-tax) income. To put this cohabitation dividend in proper perspective, before tax it is the same as going from earning £24,900 to earning £34,700: a pay rise of 40 per cent. This is just an example, and the figures depend on your earnings. And while economists and governments need a way to compare incomes between different family types, that doesn’t mean it’s an exact science. Nonetheless, and according with common sense, the economic gains from cohabitation are big. So, what would happen if all the single people in the UK paired off? There are around 13 million non-pensioners living without a partner (compared to around 12 million non-pensioner couples). The graph below shows a rough attempt to model what would happen to equivalised household incomes if around 6.6 million new cohabiting couples were created this Valentine’s Day. 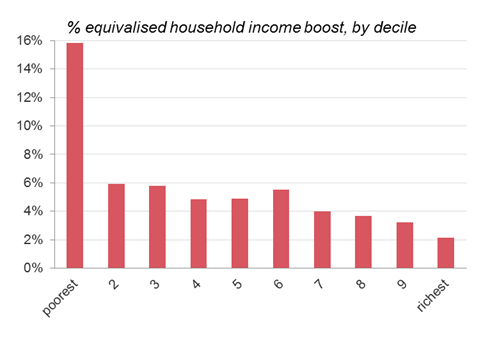 The income increases are substantial (bear in mind that these averages include existing couples – whose incomes would be unchanged), and would narrow the gap between poor and rich. This is a far more positive impact than most tax cuts or benefit increases, not least because there are no losers (except maybe dating app developers). For these figures, people have been matched to someone with an income very close to theirs. This ‘assortative mating’ is a real trend and has played a part in increasing inequality. If people mixed more randomly with people of other incomes then the gains at the bottom would be even greater. And for individuals the big increase in living standards from cohabitation, on top of any other advantages (and disadvantages), must raise the question of whether it really is better to spend your time working hard for a pay rise, or whether you’re better off financially taking your partner – or future partner – out to dinner.